Click on the "Facility" building-shaped icon. 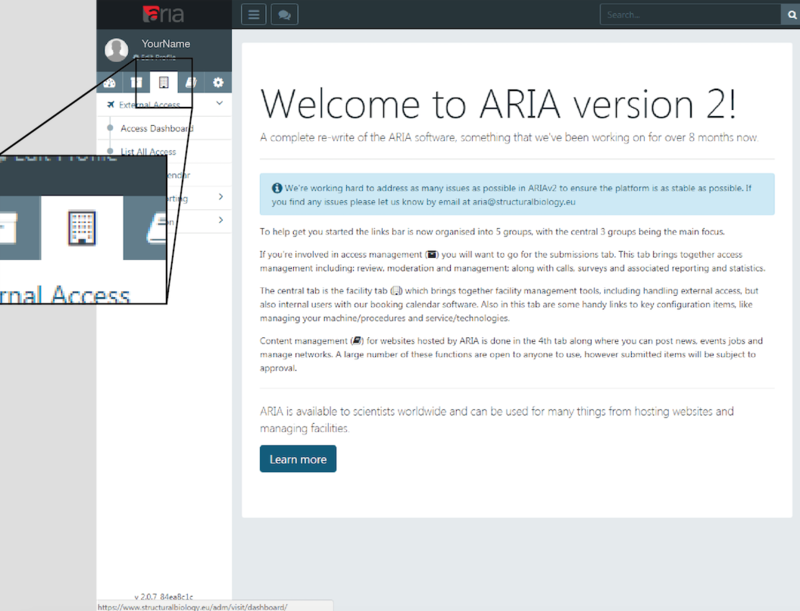 Click on "External Access", then "Access Dashboard". 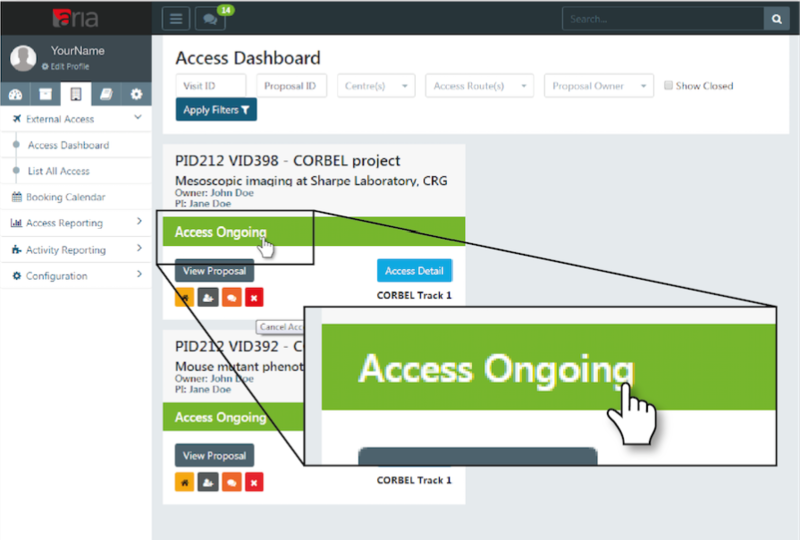 The access dashboard can be filtered for Visit ID (VID), Proposal ID (PID), Centre, Access Route or Proposal Owner by typing or selecting in the appropriate fields, and clicking "Apply Filters". Once the visit with machine/method access to modify has been located, click the visit status link (This is the text in the coloured bar on the access dashboard e.g. Technical Evaluation/Access Ongoing/Awaiting Visit Date Confirmation). The visit page should appear. From this page you can easily view the visit pipeline, contact the access user, view the proposal, modify machine/method access and cancel the whole visit. In the "Add/Select machines/methods" panel, select a machine/method where multiple are present from the dropdown list. To add the selected machine/method to the visit click "Add Machine/method"
A machine/method should appear as a panel on the visit page. 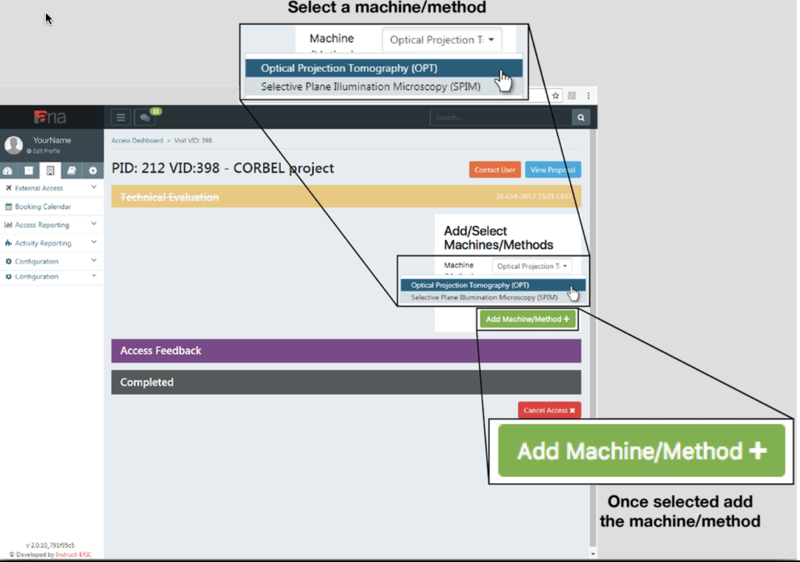 To remove a machine/method already associated with a visit click the "Cancel Machine/Method Access" button in the panel for that machine/method. Note that this does not cancel the visit to the facility, only access to the specified machine/method. To cancel the whole visit please see Cancelling a visit. Confirm the cancellation by selecting "OK" in the pop-up window at the top of the page.